I bet he loved being carted around. First, that is one strong grocery bag! Quite a testament for that product! Second, that is the cutest thing I seen today! Love it! I bet you all had a blast with that! Love it.. bet he did also. 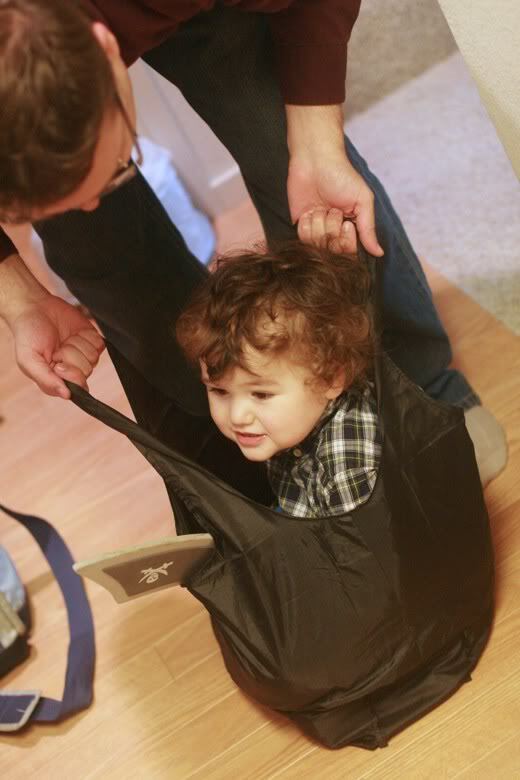 cute lil boy in a shopper's bag. TOO FUNNY. And believe it or not, this is the 2nd blog I've seen with this theme. Too funny. Thanks for droppin by! OMG.... that hair! I just love it. My boys, all three of them, look so strange with hair. They all have buzz cuts! Thanks for stopping by and linking up again this week. See you on Twitter! Have a fabulous day. aww what a cutie looks like fun. B) That linky list is super cool, that must have taken FOREVER to put together, thanks for including me! Love it! Eco-friendly grocery bag and kiddo carrier! :) Happy WW! Too funny. We did this with my daughter once and got a video of it. I should really learn how to put video (my own, that is) on my blog. That's a pretty tough bag. I think my kids would fall right through mine. haha kids like the funniest things dont they. she will want you to take her out in it next time! That is really cute....my little ones love those bags too....they also love boxes! Happy WW to you! Too Cute I love it! That is so cute! What a peanut you have there. Adorable. 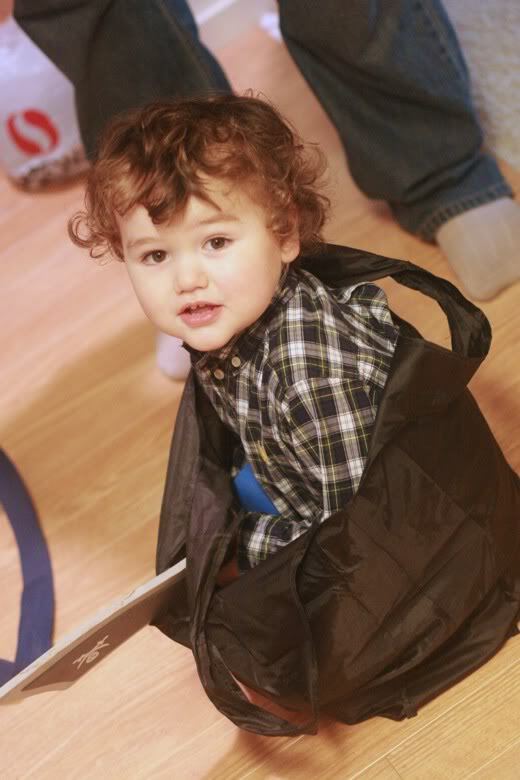 adorable boy and one sturdy bag! there must been a huge sale on Cute. So, so cute AND I have a bit of an obsession with re-usable bags, so this post is win-win for me. 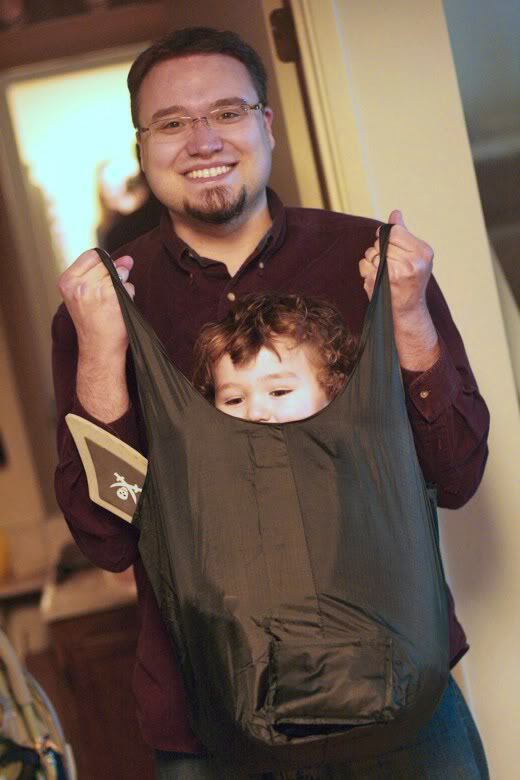 I figure this is an eco-friendly way of carrying our toddler! :) He weighs 37 pounds, so kudos to my husband for hefting him over and over. I will point out, too, that this was my son's idea in the first place and now one of his favorite things. If you want your own toddler-proof bag, we got ours at Safeway. They're the kind that fold into a little pouch. Love 'em. Alicia: How funny! I'll have to find my sister blog. Pamela: I seriously am so jealous of his curls. I'll be sad when he wants his own buzz cut someday. Julie from Momspective: It kinda did take forever. Thanks for liking it! :) It makes it easier for me to find the linkies, so I figured it might help other people, too. Melodie: I usually post on YouTube and then embed, but you have to be OK with having it public on YouTube. You can also do Vimeo. Maman A Droit & Geeks in Rome: I've thought he'd make a great child model (of course I do; I'm his mother) and then I remember: He's not the least bit obedient. We'd go to a casting call and the photographer would say, Stand there, and Mikko would say, No, and that would be the end of his modeling career. :) I guess I'll content myself with enjoying his beauty privately … Ha ha! You know, I saw a link today for a blog called Hobo Man. I was going to check it out, but forgot, so I have no idea what's on there. The pictures are cute and made me laugh. My fav reusable shopping bad is a big canvas one from World Market. thanks for stoppin by and commenting!! the "pee" comment cracked me up too....made me feel ALOT better about what i had done! BTW, i use picnik, as well as photoscape (which is FREE) for my photos....they rock! That's really cute. Strong bag! Love the bag shots! Ha ha, thats great! And whoops, I just saw that you wanted us to link to a web photo and I didn't, because the linky couldn't find any of my photos online. Not sure what was up with that, but I just uploaded via my computer. Hope thats okay! Lisa C: I find the funniest hobo links sometimes, like a whole hobo wedding once. Cracks me up! lisaj: I will have to try those out. They look awesome! Kristin: I don't mind at all if you use from computer if that's what works for you! I was just pleasantly surprised it could pull a picture from my site via the "from web" function since I didn't have the file on my computer the first time I used it. Glad you found something that worked for you! I'll update my instructions for next time. Omgosh that is just so adorable! I wish my local grocery store carried toddlers. They are CUTE! Also screamy, but I'm focusing on the cute right now. See -- so many uses for those bags! Who knew? Just a belated "Thank You" for linking up to my WW linky last week! I just love that you captured that in photos. They are so candid and having so much fun! 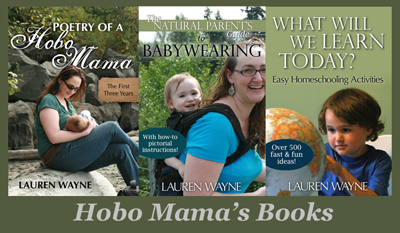 My new linky is up and you and your readers are welcome to it also!